Currently underway is English National Ballet and English National Ballet School’s presentation of My First Ballet: Cinderella, on its national tour until 30 July 2017. My First Ballet: Cinderella is a reimagined version of the classic fairytale, created especially for children as young as three in a theatrical setting. Adapted to just an hour in length and with a narrator to help young audiences follow the story, My First Ballet: Cinderella is the perfect introduction to the magic of ballet. My First Ballet: Cinderella opened in Dartford on 6 April 2017 before embarking on a national tour. It went on to play at The Peacock, London (11-22 April), ahead of its journeying to New Theatre Oxford (28 & 29 April), Liverpool Empire (5 & 6 May), New Wimbledon Theatre (13 & 14 May), Bristol Hippodrome (20 & 21 May), and New Victoria Theatre Woking (26 & 27 May). The production will also return later in the summer, in July, for an additional run of summer performances at The Peacock, London (18-23 July) and Manchester Opera House (26-30 July). Choreographed by George Williamson, an award-winning former student of English National Ballet School, My First Ballet: Cinderella is part of the My First Ballet series which enters its sixth year in 2017, delighting audiences all over the country. 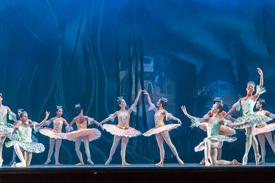 Since its inception in 2012, over 200,000 people have enjoyed the series which has included the hugely successful My First Ballet: Swan Lake, Coppélia and Sleeping Beauty. The My First Ballet series is performed by second year students of English National Ballet School, providing them with valuable rehearsal and performance experience within a professional touring company. Performances on dates in July 2017 at The Peacock and Manchester Opera House will not however be performed by dancers from English National Ballet School.